The movies this weekend acted as the warm blanket following an intense and controversial election campaign, and many sought comfort at theaters. Following the weekend where Doctor Strange broke a long streak of futility at the box office, new releases were not built to be number one; they were built to "fill in" demographic holes in order to find success. The biggest new release this weekend is Arrival, a sci-fi thought-piece starring Amy Adams, which is aimed more at the Inception crowd than the Independence Day audience. Also opening were Almost Christmas, an urban comedy from uber-producer Will Packer, and Shut In, a poorly made thriller with Naomi Watts, looking to recapture what went down in The Ring. Add decent holdover results from Doctor Strange, Trolls and Hacksaw Ridge, and we have ourselves a weekend. 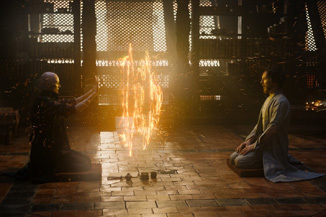 The number one film of the weekend is Doctor Strange, repeating on top after dominating last weekend with $85.1 million. On its second Friday, Doctor Strange continued to excel, earning $15.1 million. While that was off 54% from the Marvel behemoth’s first Friday amount of $32.6 million, it’s important to keep in mind that Doctor Strange also earned $9.4 million from Thursday previews last weekend, throwing off any percentage drops. Doctor Strange’s first Friday – without the previews – came in at $23.2 million, which makes the comparison look much better. Part of the assist came from Veteran’s Day on Friday, where some were out of school or off work, opening the door for the box office, especially for films aimed at the younger demographics. Over the weekend proper, Marvel’s Doctor Strange managed $43 million, off a not bad 49% compared to its opening weekend. The best comparison has to be Thor: The Dark World, as that is the only Marvel film released in November. Thor 2 fell 57% in its second weekend, moving from an $85.7 million opening to a $36.6 million second frame. The Dark World went on to earn $206 million, and Doctor Strange should do much better. Reviews and Cinemascores were better than the Thor sequel, and I see Doctor Strange playing longer into the holiday season. So far, the $165 million budgeted Marvel/Disney release has earned $153 million stateside, and has pulled in another $340 million overseas. Not to be outdone, Trolls also holds its number two spot versus three openers and has a stellar hold on Veteran’s Day, setting it up for a decent weekend. With a lot of kids out school, Trolls earned a wild $12.2 million – off only 1% from its opening Friday. Its second Friday acted as a Saturday, but removed the chance of a big multiplier compared to its Friday gross. The DreamWorks Animation and Fox release ended up with $35.1 million over the weekend, giving it a decent drop of only 25%. This is exactly what this film needed, as after a $46.6 million opening frame, it had a long way to go to match its $125 million production budget. Trolls now has a domestic gross to date of $94 million, and it has picked up over $125 million at the overseas box office. With a target worldwide gross of $375 million, Trolls appears to be on its way to reaching that figure. Finishing third is Arrival, the new Amy Adams sci-fi release from Paramount. Arrival puts more emphasis on science than fiction, and the result is a very well-reviewed think-piece; however, it looks like only very discerning adults showed up this weekend. It got started on Thursday night at previews, earning $1.45 million. This is similar to the results we saw through the fall season, where films would start with a similar preview amount and move on to earn $20-25 million. The Friday number was somewhat stronger than those results, but likely only because of the Veteran’s Day Friday. Arrival earned $9.4 million over its combined Thursday preview/Friday, a decent but somewhat unspectacular start. Interstellar started with $16.9 million but was admittedly a bigger film. Arrival was more on target with films like Edge of Tomorrow (Live Die Repeat), which started with $10.6 million on its first day. The weekend result for Arrival came in at a decent $24 million and it should be considered that Paramount launched the Amy Adams flick at only 2,317 venues. Why would the studio launch this one over such a limited run? Arrival is a very good movie – currently 93% fresh at RottenTomatoes, which has the studio looking for a long run into the holiday season as they have the opportunity to expand the venue count. The problem with the movie is the Cinemascore. Arrival earned only a B from audiences, lower than Bridge of Spies (another adult thriller/think piece) score of A, but in the same ballpark as Interstellar and Inception (both earned a B+). The best news for Paramount is that this one cost only $47 million to make and has Adams being mentioned as an Oscar contender. It will be very interesting to see what happens to Arrival next weekend, but for now, Paramount looks to have a winner should this one do decently overseas. Comedy Almost Christmas is fourth, opening more than a month before Santa Claus comes to town. The Universal release was ready to celebrate early and did, recording a $5.9 million gross on Friday. That’s almost exactly the same score as Tyler Perry’s A Madea Christmas, which got started with $5.7 million on its opening day, although it was released much closer to Christmas, on December 13th. Almost Christmas was able to turn that strong opening day into a weekend gross of $15.6 million, again from a moderate venue count of 2,376. The opening weekend is also similar to This Christmas from Screen Gems, as it was also produced by Will Packer and opened to $18 million in November 2007. It went on to earn a healthy $50 million domestic against a $13 million budget. Reviews for Almost Christmas were mixed, with the RottenTomatoes score coming in at 42% fresh and the Cinemascore a solid A-. Regardless of reviews, Almost Christmas producer Will Packer continues to crank out the hits. The two Ride Along films earned almost $300 million worldwide versus a combined production budget of $65 million, No Good Deed earned $55 million worldwide against a $13 million budget, and the two Think Like a Man films grossed $166 million worldwide against a combined $36 million production cost. These aren’t blockbuster amounts, but combined, Will Packer has a resume where the combined domestic box office has reached $1 billion. Fifth this weekend is Hacksaw Ridge; a film one might think would do very well over Veteran’s Day weekend. It did okay, down 29% Friday-to-Friday and 29% over the entire weekend, as it pulled in $10.8 million. The Mel Gibson faith-based anti-war movie has now earned $32.3 million domestically, against a budget of about $40 million. Sixth is Ben Affleck as The Accountant, a film that has seen some holding power in the top ten. Now in its fifth weekend, The Accounted found another $4.6 million to bring its tally up to $77.7 million. It's looking like a good investment, as the film cost $44 million to make and has earned $128 million worldwide thus far. Seventh is new release Shut In, the critically derided new horror thriller from Luc Besson’s EuropaCorp. This one tricked $3.7 million out of the pockets of moviegoers, an ugly opening weekend for a film that likely never should have seen the light of day. It is currently 0% fresh at Rotten Tomatoes, and sounds like a disaster. The Cinemascore was recorded at a ridiculously low C, and Shut In will be a footnote in history very shortly. EuropaCorp's first two releases in North America have been Nine Lives, the talking cat movie with Kevin Spacey (11% fresh) and Shut In (0% fresh). Shut In is rumored to only have a $10 million budget, so at least the financial backlash won’t be too severe. Eighth is Boo! A Madea Halloween, which is quickly disappearing post Halloween. This weekend Boo! earned $3.6 million and fell 54%. The Lionsgate release has now earned $70.4 million. Ninth is Jack Reacher: Never Go Back, a movie that opened softly and quickly disappeared. In its fourth weekend, the Tom Cruise flick earned $3.3 million and dropped 39%. The $60 million release has now pulled in $54.6 million in North America and $127 million worldwide. Tenth is Inferno, the Tom Hanks/Ron Howard sequel. The domestic box office disaster picked up another $3.2 million this weekend and dropped 47%. While the domestic total has reached only $31.6 million, the overseas gross has surpassed $170 million, which is going to leave this one in fair condition, considering the $75 million production budget. Overall, the large spread of healthy films in the top 12 buoyed the overall score to $150.3 million, a huge increase over last year's weekend take of $96.3 million. Our next frame at the box office promises to be big, big, big, as Warner Bros. returns to the JK Rowling's wizarding world with Fantastic Beasts and Where to Find Them. Other new releases include The Edge of Seventeen and Bleed for This.